For the entirety of the Victorian era, British gentleman scientists, gathered in the great halls (and back-rooms) of learned societies, were a driving force in the advancement of astronomy. Much of the research was undertaken by the wealthy. These men could afford the equipment, and had the time to utilize it. It was considered their duty to use their means to promote and advance science. I have a fascination with the Kew Observatory, in London. It was set up originally so that King George III could watch the Transit of Venus in 1769. The building sat empty until 1842 when the British Association for the Advancement of Science started installing various instruments ranging from self recording magnetometers to a solar telescope. It is, in fact the latter that piqued my interest. The Sun in the mid 19th century was to become one of the greatest research subjects for several decades. It had been known for centuries that the Sun had changing spots, and through observation during eclipses has an atmosphere of sorts. In the 1850s celestial photography, while in its infancy was gaining a reputation for accurate representations of the heavenly bodies that occupy our solar system. Drawing of John Herschel, published in 1846. Credit: Public Domain. Sir John Herschel, himself a photographic scientist and astronomer urged, in April of 1854 the construction of a camera with the sole purpose of photographing the sun. 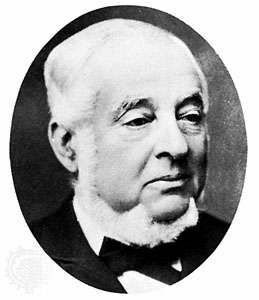 He wrote to The British association For the Advancement of Science (BAAS): “With regard to proper preparations of paper, or the use of collodion, &c., the photographic art is now so much advanced that no difficulty can arise in fixing upon fitting preparations,or in the manipulations necessary for multiplying them. But it would be very requisite that many impressions of each day's work should be taken and distributed, and an interchange kept up among observers.” He envisioned several solar observatories located in different longitudes to photograph daily, and share the data so to compare them. Any differences would be apparent. At the time, the solar corona was a hypothesis, and granulationon the surface was left to the interpretation of an artist. He suggests sensitized paper or “collodionized” glass (Report of the 24th meeting of the BAAS 1853-54) Having researched the state of the art photographic media of the time, he was on the leading edge of scientific photography. He suggested, among other things a “pretty large” 3” objective, a large photographic plate, and crosshairs to measure angles on the disc. The somewhat ambitious project was taken up by the committee in charge of the observatory at Kew Gardens. Kew had been built some 85 years previous to observe the transit of Venus. The British Association For the Advancement of Science had taken over in 1842. It was being used for chronometer, sextant, and barometer calibration. Kew instrumentation was considered some of the best in the world. Other studies at the time of Herschel’s proposal involved terrestrial magnetism, and meteorological studies. De la Rue. Credit: Burndy Library, Norwalk, Conn. The man chosen to lead this project was Warren De La Rue. He was a successful businessman, and an avid scientist. 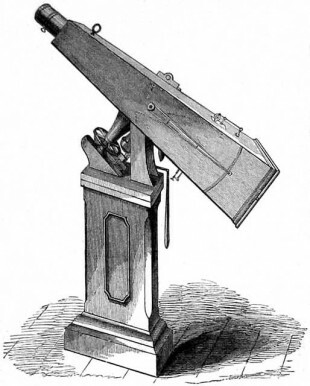 Indeed his private observatory boasted many enviable instruments that a college observatory today would want to use. Not only were his scientific and business prowess thought of when choosing him to take this on, but also his use of the new collodion photographic process for photographing the moon and planets. (though later he would wonder if solar photography would better suit the Daguerreotype process). He appears, by all accounts to be enthusiastic about the many scientific endeavours he undertook. It seems he approached this project with gusto, ensuring the best possible outcome. Design and construction of the solar photographic telescope began in 1854. The Andrew Ross co was hired to build the instrument. The estimated cost was £180. The Kew committee allocated £150, and Benjamin Oliveira, M.P. and fellow of the Society donated another £100 over 2 years. It was finished by the meeting of the Society in 1856. This meeting covered 1855/56. In the meantime, the Kew Observatory was being prepared to receive what by this time was called the Kew Photoheliograph. The electrical and magnetic measuring equipment was consolidated, and wind, solar, and atmospheric clarity were measured to ensure this was the best place for the telescope. Several changes were made by Ross to the telescope during construction. Initially a separate dome with a darkroom was to be erected, 12 feet in diameter. The focusing screen was to be 8 feet away, as Herschel’s original proposal indicated that the screen be 5 feet on a side. It was decided to use the existing 10 foot observatory dome. During the intervening months, it must of been decided that such a mammoth photograph was not needed, owing to the much smaller 12” screen on the finished telescope. The report of 1856/57 describes the completed instrument. It is approx. 5 feet long, and pyramidal in shape with the objective end being 4” and the plate holding end 12”. The lens, made by Ross was a 3.4” diameter f/14.7 undercorrected Achromat. The undercorrection was to provide a better chemical focus, eliminating the need to focus optically, then move the plate forward to be on the same plane as the blue end of the solar spectrum. The design of the telescope was thus: the objective focused to an ordinary Huygens eyepiece. This projected the focused image of the sun onto the photographic plate. By changing the focal length of the eyepiece the diameter of the image could be changed. Also included inside the instrument was a crosshair made of platinum wire and held tight with springs. This was set midway through the focus of the eyepiece. The photographic plate holder was ordinary, as found in cameras of the day. The mount was a German Equatorial style made of solid gunmetal, a bronze alloy. The angle was fixed, as the telescope mount was a permanent one, and was mounted on a cast iron pedestal inside the observatory dome. The tracking was weight driven clockwork with a conical friction clutch to control the speed. By 1857 the Photoheliograph was installed, and the recording attempts started. Welcome Chris! Cool stuff. Ya’ll, is the Catholic Astronomer a great science site or what?